Ninh Bình is known as 'the inland Halong Bay' to many, for its towering limestone karsts and stunning scenery. We arrived in Ninh Bình from Halong Bay by means of a dodgy bus - it cost $10 each (booked in Hanoi, June 2016) and took the grand total of eight hours door to door. Yes, eight hours to travel around 200km. Vietnam really lived up to its reputation of being the land of the con with dodgy bus drivers, bribes being offered and taken and that feeling of not quite knowing if you'll make it to your destination. I mean, in hindsight it was fairly amusing, but at the time... less so! We were finally dropped in Tam Cốc - about 9km outside of Ninh Bình - at The Long Hotel. Turns out this is a fairly common scam where the hotel owners are in cahoots with the bus operator, attempting to get you to stay at their (pretty gross) hotel on arrival. We refused and got a 'taxi' (some random bloke drove us for a bit of cash) to Ninh Bình town and to our pre-booked hotel. Long indeed. We stayed at the Vancouver Hotel in Ninh Bình which we can't recommend enough; clean rooms, super comfy beds, a great breakfast and the friendliest staff ever! They booked our train tickets to Phong Nha for us, and pointed us in the direction of good street food. Oh, and it cost £17 a night! Perfect. 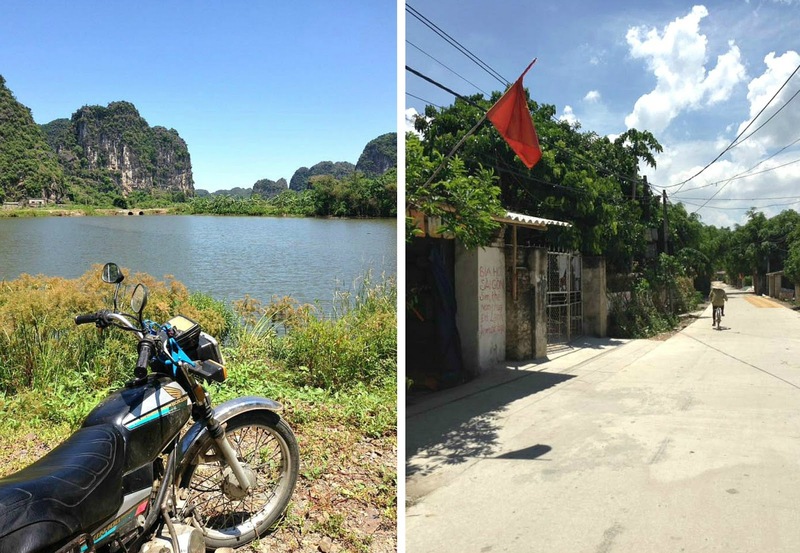 We were able to hire a scooter from the hotel for $7 a day; not the cheapest, but meant we had some freedom to go and explore. Hire a bike - we met up with some friends who we met back on the slow boat to Laos, and decided upon exploring on our bikes. These days spent road tripping with a packed lunch and a vague direction were just the best - total freedom! The scenery in Ninh Bình is just stunning; in fact the beauty of Vietnam totally spoilt us for the rest of our trip round SE Asia. There is nothing quite like the landscape of central Vietnam. Exploring on bike means you have free rein to do your own thing... I can't quite describe that amazing feeling of scooting off on your bike, totally free to explore and adventure as you wish! Mua cave and viewpoint - park your bike in the car park and walk round, through the park to the 500 steps up to the viewpoint. The view is incredible; looking over the limestone karsts and the Tam Cốc river you can see for miles! Be sure you are wearing some decent trainers or sandals as the steps aint easy. Afterwards you can check out the cave itself - nothing too exciting but worth a look. Boat trip - this boat trip takes you through various caves and tunnels, down the Tam Cốc river. Costing 390,000 dong (around £12 in June 2016) per couple - each boat sits two plus a rower. The locals operating the boat row using their feet! The tour lasts around two hours and makes for a relaxing and scenic trip. Beware of women approaching your boat selling stuff, just say no... repeatedly... and they should may leave you alone. Chookies - Western-style burgers and toasties! Time Cafe - Good coffee and equally strong aircon, hurrah. Father Cooking - excellent home cooked local food in Tam Cốc. Street food joint opposite Vancouver Hotel entrance - no idea what we ate, but was delicious! We left Ninh Bình to get the sleeper train to Dong Hoi for Phong Nha - booked through our hotel it cost 545,000 dong (around £18 in Jue 2016) and left at 10:27pm, arriving in Dong Hoi at 6:40am. The train itself was pretty comfortable! We were sharing a cabin with an American couple who got the two bottom bunks; these are the best spots as you have a table between the two meaning you can play cards etc and don't need to climb up to the top bunk. The top bunks are also closer to the air conditioning vent - I was pretty cold under the breeze. When we arrived in Dong Hoi we got a taxi to the bus station, where we got a bus to Phong Nha. I can't remember how we found the bus, but I do remember it being pretty straightforward! If in doubt, ask someone - Google translate is your friend! The bus cost 35,000 dong each and took about an hour - it stopped right outside of our accommodation, Paradise Hotel, where we were able to check in at 8am for a shower before a day of exploring. Explore the caves - this is what Phong Nha is all about! Hire a scooter to do it yourself and save a heap on an organised tour - it also gives you the freedom to do it at your own pace. Dark Cave - I have to admit I wimped out of this one, but Rich bought a ticket for the full adventure experience! It started with a 400m long zipline set 30m above the river, before swimming to the cave entrance. Once there the group walked down a passageway in to the cave, before sliding down a mud slide into a muddy swamp. The mud was buoyant meaning they floated on the surface - a weird sensation so I'm told! Then came kayaking and another zip line before washing off in a bucket shower. Paradise Cave - the main event, Thiên Đường or Paradise cave (250,000 dong per person) was discovered in 2005 and extends 31km! It really it spectacular - there's no need to be worried of small, cramped spaces as it's bloody massive. Be prepared for the trek up to the cave entrance though; it's an exhaustingly long, steep ramp. Including the walk up and (self-guided) tour it takes a couple of hours in total, so leave yourself plenty of time. We had some lunch at the restaurant near the car park to fuel ourselves beforehand! Phong Nha Cave - find some new friends to split the boat cost with (150,000 dong per person plus 350,000 dong boat hire) and enjoy the thirty minute boat trip down the river and in to the mouth of the cave. Once inside you get out of the boat and explore the cave in more detail, before walking a little up to the boat again. Again, a really impressive cave system which was thought to be the biggest in the area until Paradise cave was discovered. Capture - this was such a great find! Amazing pizzas, sandwiches, breakfasts and pancakes this was the Western food we were craving after four months in SE Asia. The wholewheat pancakes were out of this world! They also do lunches to go - buy a sandwich or home-style picnic lunch to take with you on your cave adventures. Yeh, we were in Phong Nha for two days (one night) and ate exclusively here - it was that good. Wow thank you for sharing your experience and amazing adventure! We are going to North Vietnam in a couple of months. Our 10 day itinerary covers Hanoi, Holong Bay, Phonang National park, Hue, and Hoi An. We are less adventurous and older than you. We are leaning towards doing a 2 nights cruise in Halong Bay instead of a one night cruise and a day trip to Ninh Binh. We are thinking a 2 nights cruise get us an opportunity to get away from the crowd and enjoy the unique experience of the Halong bay. What do you think?